Did you know that your customers’ experience with your brand is only as good as your back-end data integration? If you’re just starting out your research into data integration, or if you’re one of those poor souls that have been led down the primrose path by a less-than-honest sales person, you might still not fully understand the connection between the quality of your omni-channel data integration solution or service, and the level of satisfaction your customers feel when interacting with your brand across all channels. The fact of the matter is that if your business’ systems are incomplete in their integration, are haphazardly tied together through a ‘spaghetti factory’ of plug-and-play integrations, or worst of all, not integrated at all, your customers will notice because their experience with your brand will suffer at several points along their journey. But why explain all this in words when we can use memes? Keep reading to see three memes of ways customer expectation is effected by the quality of your data integration solution! This category really expands to any touch-point your brand has with your customers across all channels, including B2B and B2C, brick-and-mortar locations, and online. Customers approach any interaction with any company with certain baggage based on their past experiences. 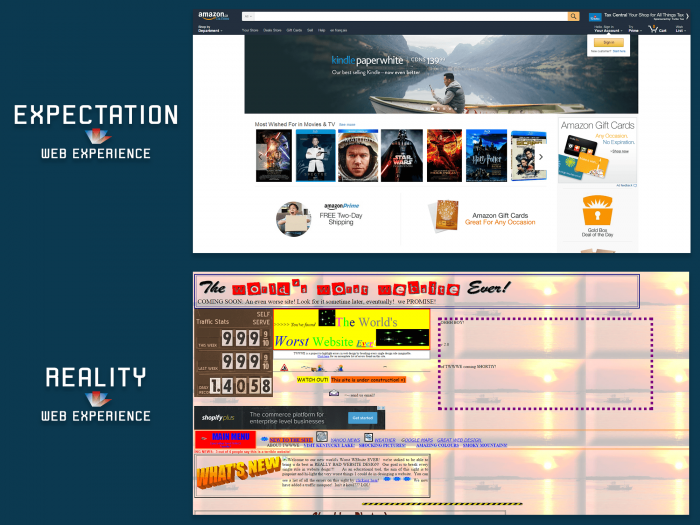 Unfortunately for many businesses, the customer experience benchmark has been set incredibly high by websites like Amazon. 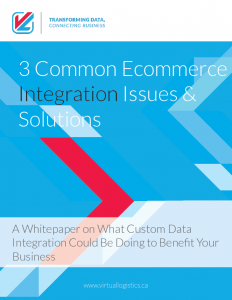 While customized data integration won’t help your website go from The World’s Worst Website to a top ecommerce destination, it will make sure your customers have the same experience at every omni-channel touch point. Learn more here and here, or talk to the experts at VL here. Nothing’s more disappointing and frustrating from a customer’s point of view than completing your order and hearing… nothing. Most of us have been there: sitting there, staring at your phone or computer, waiting for a confirmation notice of your order that sometimes just never comes. Sometimes we get an email like the one above, garbled to no end. Either way, the customer’s expectation hasn’t been met – and it’s having an effect on how they perceive your brand. How does proper data integration help? A customized service provider can tie all of your business’ back-end applications together so that the data from your ecommerce platform, payment platform, CRM, marketing automation software, ERP & MRP, and more flow automatically between the programs. That means your order status emails, including if they’re on time or delayed, can be automatically generated and sent without the direct management of a warm body in a chair typing away. This keeps your customers happy while keeping your time open for other, more important tasks. You can learn more about what happens when email communication between the customer and the business break down in this great case study ebook. 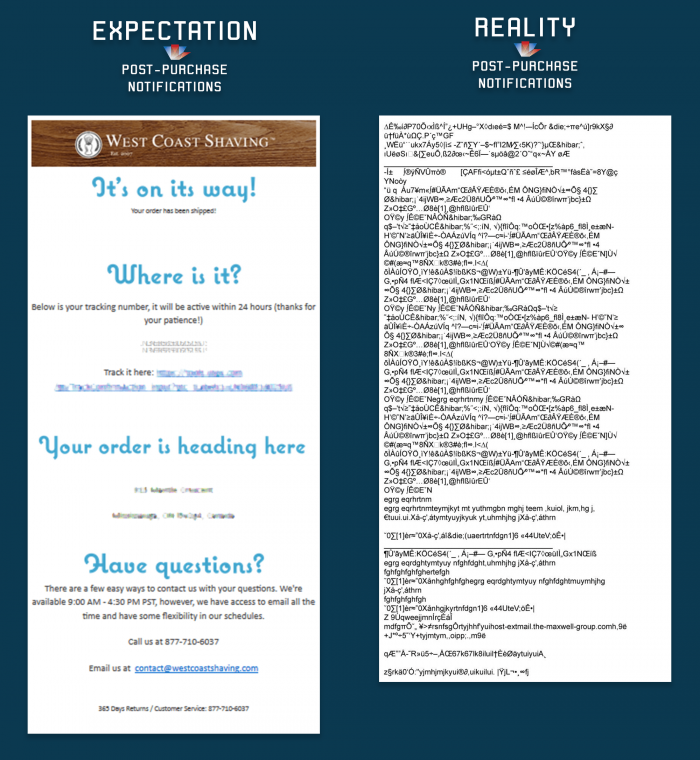 What some businesses get (and others don’t) is that how your product is delivered to the customer is your last chance touch point for that order. If you don’t hit the customer’s expectations just right, chances are this touch point could be the last touch point you have with that particular customer ever. Making sure your company is fully integrated with your 3PLs, Shipping partners, and more is just one step to ensuring your customer’s expectations are met and exceeded at their doorstep. But it’s important to go one step further and ensure that your entire system is integrated, including your ERP & MRP. In summary, customer experience is hard enough to master, but trying to manage customer experience and customer expectation without proper omni-channel data integration is getting near impossible in today’s high-tech world.